Be the first to share your favorite memory, photo or story of Fritz. This memorial page is dedicated for family, friends and future generations to celebrate the life of their loved one. 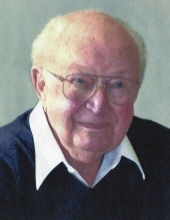 Fritz Doermann, 94, of Sheboygan, passed away on Wednesday, March 27, 2019 at Sharon S. Richardson Community Hospice in Sheboygan Falls. Fritz was born November 17, 1924 in Sende, Germany to Heinrich and Luise (Nolte) Doermann. Fritz joined the German Army and served during WWII from 1942 to 1945. On June 18, 1948 he was united in marriage to Irmgard Grabowski in Eckardtsheim, Germany. Fritz worked in Tool & Die and served his apprenticeship with Siemens in Germany. In 1952 Fritz, Irmgard and their son Jochen immigrated to Sheboygan, and in 1957 they became US Citizens. Fritz worked for Plastics Engineering and retired in 1988. He was a gifted craftsman, enjoyed working in his workshop, in the basement. He built furniture and remodeled his home. Fritz also loved technology, he worked on his computer digitizing old records and restoring old photos. He is survived by his wife of 71 years, Irmgard Doermann, sons; Jochen (Bonnie) Doermann of DeForest, Peter (Jill) Doermann of Chippewa Falls, and Andy (Barb) Doermann of Mequon, nine grandchildren, thirteen great-grandchildren, nieces, other relatives and friends. He was preceded in death by his parents, five sisters, and two brothers-in-law. A Memorial Service will be held on Saturday, March 30, 2019 at 4:00 PM at Ballhorn Chapels Funeral & Cremation Care Center, 1201 N. 8th St., Sheboygan, with Pastor Ethan Tews officiating. Relatives and friends may visit with the family on Saturday, March 30, 2019 from 3:00 PM until the time of service at the FUNERAL HOME. In lieu of flowers memorials may be made to Sharon S. Richardson Hospice in Fritz’s name. To send flowers or a remembrance gift to the family of Fritz Doermann, please visit our Tribute Store. "Email Address" would like to share the life celebration of Fritz Doermann. Click on the "link" to go to share a favorite memory or leave a condolence message for the family.